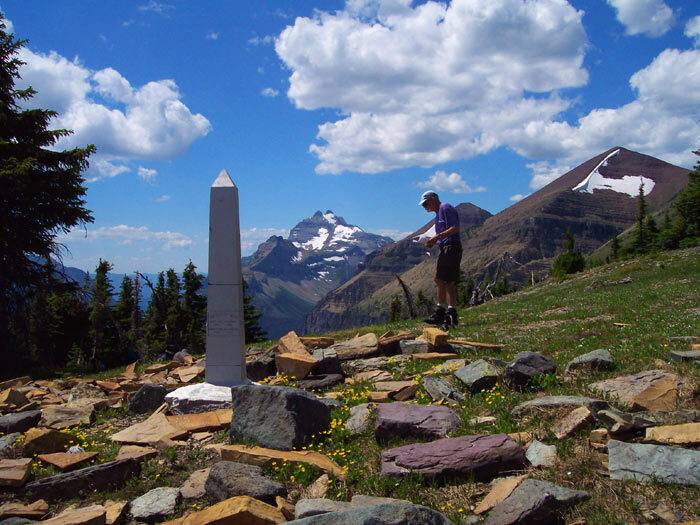 Ted Patten: The oldest non-native american archaeological site in Glacier National Park. The oldest non-native american archaeological site in Glacier National Park. This site marks the continental divide and the determined location of the 49th parallel in 1861. The large cairn was demolished in 1901 in preparation for the recovery and placement of the bronze (aluminum paint for visibility) monuments. Long Knife Mtn. and the "ballpark" can be seen in the background, Kintla Lake hidden by foliage. Click photo for larger view.